While I used to be low carb, potatoes are back on rotation with a Ray Peat inspired diet. Love ‘em – mashed, baked, boiled then fried with eggs like German Bratkartoffeln and of course potato salad. I have read somewhere about resistant starch where if you eat cooked then chilled potatoes, a portion of it remains undigested until it reaches your large intestine and feeds the good bacteria there. So it has less carbs than you think and is gut healthy! It still has lots more carbs though than most veges so go easy, but a few spoonfuls to add to your plate with the rest of your green salad and whatever else you are eating, just adds a creamy taste to liven up the whole plate. But it’s the dressing that makes the whole thing so divine. The normal recipe usually has heavy cream and/or mayonnaise and some people use sour cream and I used yoghurt for a while which was awesome too. However I am trying dairy-free for a while and used coconut cream and loved it! I was worried that the coconut cream might make it too sweet tasting and of course potentially too coconutty. But the olive oil and salt seems to overpower it and so it just tastes super creamy and delish. I find I like it best on a bed of rocket, a few spoons of the potato salad on top and then tuna in olive oil – so unbelievably tasty. 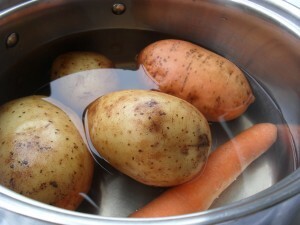 So with the skin still on the potato, boil in a pot until a sharp knife can easily go through to the middle. Then cool on the bench for a while, then place covered in the fridge to chill – usually overnight is best. Hard boil the eggs and chill as well – overnight if you can. Peel the potato with a small knife and cut into small cubes, throw in a bowl. Peel the eggs, roughly chop and throw in the bowl. Then add all the dressing components and mix through. Store covered in the fridge for about a week. Again if you are using any of the other veges listed above, they all must be cooked first then cooled. And to make it super dooper gut healthy, stir through a couple of spoonfuls of raw fermented sauerkraut (the one you find in the fridge, so all the healthy bacteria are still alive) or pickles made the same way – chop finely then add it in. These both will add a great tang to the dish as well as keeping your gut in fine form! Some brands I know that make the real deal pickles and kraut are Louis and Son, and Kehoe’s Kitchen. You should find it in the fridge section of your health shop. Those that are canned, or bottled and stored on the shelf of the supermarket are no good to you, as all beneficial bacteria are dead and long gone. 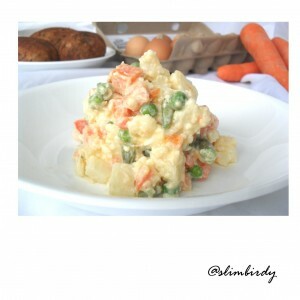 Let me know in the comments of your family favourite potato salad recipe, or if you make mine – I would love to see it!